Select a package at OptinMonster to create your account and generate an API key. Enter your API key in your site’s WordPress Admin > OptinMonster > Settings tab. 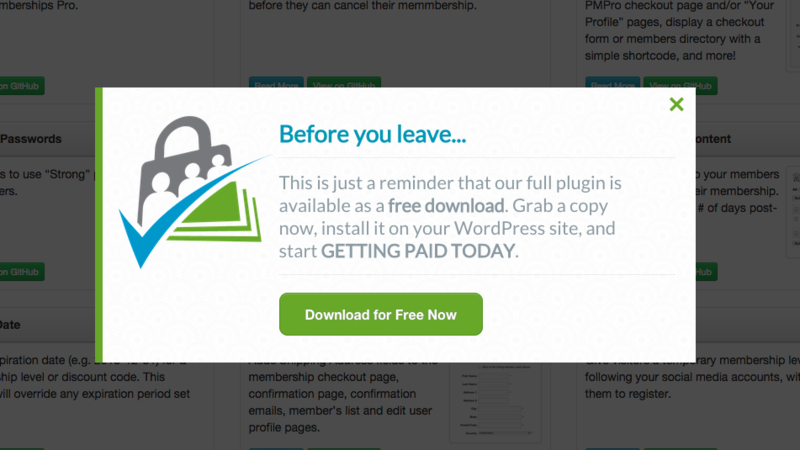 Click the “Install Addon” button for the Exit Intent Addon in your site’s WordPress Admin > OptinMonster > Addons tab. If you want to track the membership checkouts generated by your new Optin, you can do so using the Lightweight Affiliate Add On for Paid Memberships Pro. Just follow the instructions on the add on documentation to install, activate, and set up an affiliate ID for your OptinMonster campaign. Click “Add New” under the OptinMonster > Optins tab. Choose the Theme and set up the custom Design (colors, custom CSS) for your Optin. Live edit the text of your Optin in the “preview” window. Don’t worry about adding any buttons or links in the space. Under Configuration, check the “Hide for Logged-in Users?” and “Enable Enable Exit Intent?” boxes. I kept our “Exit Intent Sensitivity” at 20 (the recommended default). Under Integration, select “Custom HTML Optin Form” for “Email provider”. The id=”om-lightbox-target-optin-submit” tells my button to inherit the selected “Design” submit button appearance/styling. The href=”https://www.paidmembershipspro.com/membership-checkout/?level=7&pa=OIM” tells my button to link to my membership checkout page for level ID 7 with the Affiliate ID “OIM” (this is the unique affiliate I set up for my Optin in step 4 above. Modify the code above for your unique membership checkout page URL (https protocol if the checkout is for a paid level), level ID, and affiliate ID. Under Output, make sure you check “Enable optin on site?” to turn on your new Optin. I load our Optin “globally” but you can configure additional settings for your Optin as desired. The Optin campaign is now active on your site. You’ll be able to track membership checkouts generated by your affiliate ID under the Memberships > Affiliates admin page. If you are not using the Affiliates add on, just use your Memberships > Reports page and filter by the level your Optin is driving traffic to. You’ll be able to track the membership checkouts and see what effect the new Optin is having on signups. Good luck! This is so awesome! I can’t wait to try it out. I’m guessing you could do this both on the Levels page and then again on the actual checkout page, right? Just put a separate affiliate ID on each. This will go a long way in helping me improve my site’s conversions!